1. Make a 1" cone from pink gumpaste. 2. Flatten the sides and top of cone by hand, as shown below. 3. Using ball tool, thin the edges of flattened gumpaste. then fold the other side over the cone to create the center bud. 5. Make a hook on the #18 wire. Moisten the hook with gum glue. Insert into the center of the bud, then twist slightly to secure. Set aside to dry, then continue with the next steps. 6. 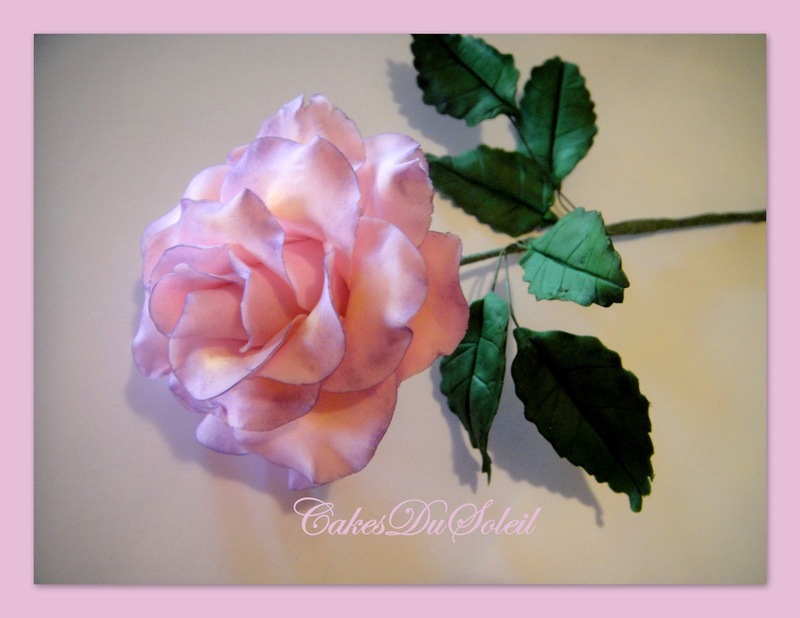 Roll pink gumpaste paper thin. Cut three petals with small rose petal cutter. 7. Gently move the ball tool in a circular motion in the center to create a cupped petal. 8. Thin the edge of the petal with ball tool. I like to make the top of the petal slightly ruffled. 9. Moisten the bottom of petal with gumglue and place on center bud. 10. Repeat with the two more petals. 11. Cut three more petals using the larger rose petal cutter. Follow steps 7 through 9. 12. Continue, 3 petals at a time, until you have the rose as full as you want. Hang upside down until completely dry. 13. Roll green gumpaste, from center to sides, creating a thick ridge in center of gumpaste. 14. Place cutter over the center of ridge to cut leaf. 15. Moisten the end of #28 wire with gum glue and thread through center of ridge. 16. Place leaf in veiner and gently press. 17. Thin the edgle of the leaf using the ball tool. 18. Curve the leaf slightly to create movement in the leaf. Repeat steps 13-18 five more times to make 6 leaves total. Then hang upside down until completly dry. 19. Brush the edges of leaves with a different shade of green petal dust. 20. I like to brush a bit of yellow in the center of rose petals. then touch the edges of petals with a darker shade using a flat brush. For this rose, I used african violet because it was to compliment a lavender cake. A dark pink or carnation red can be used also for a pinker shade. 21. Roll green gumpaste thin, but not paper thin and cut a calyx using the cutter. 22. Moisten the center of the calyx with gum glue and push the stem of the rose through the center of calyx and attach at base of rose. 22. Twist three leaves together, create two sets of leaves. 23. Cut the floral tape in half lengthwise. Starting about 3/4" from the base of the the rose, began covering the stem of the rose, moving up to the base of the rose and then spiraling down the stem. attaching and covering the stem of the leaves as you move to the end of the stem. Photography and Tutorial by Jacque Benson 2010.